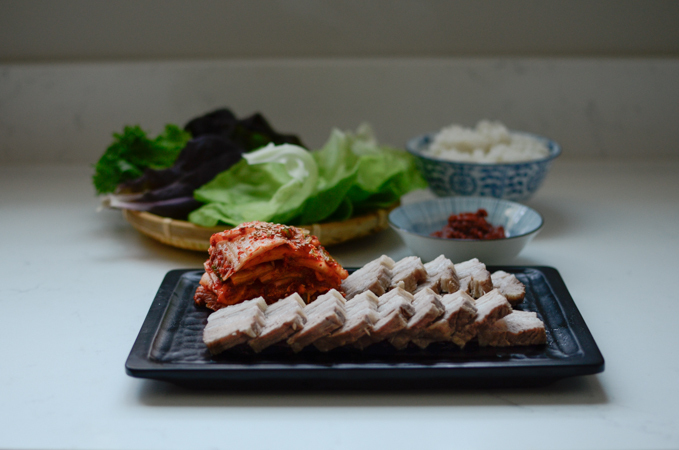 If you made a large batch of cabbage kimchi from scratch, you should follow the tradition of simmering Korean pork belly to enjoy with. The dish is called “Bossam (보쌈)“, Korean boiled pork. Pork belly is commonly used for this particular dish. Pork belly is a flavorful cut of pork (because it is fatty part of pork, duh!) and depends on how you cook it, it becomes either leathery or juicy. 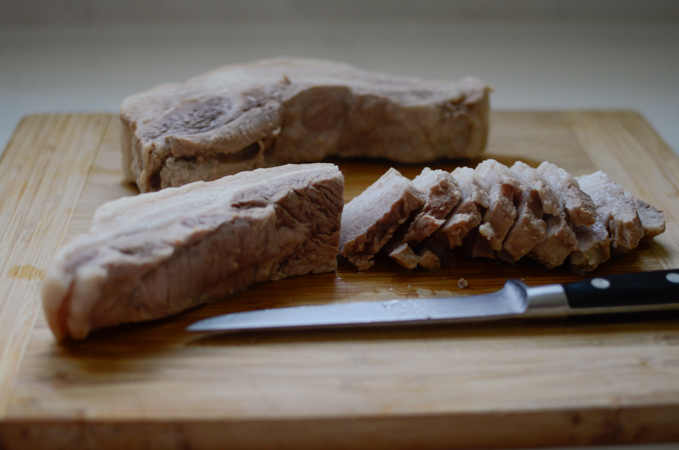 Here is one method that you can easily make at home to enjoy moist tender pork. And it taste so much better to serve with freshly made kimchi. It is mouthwatering good once you take a bite of it, and you will be hooked on. There are a couple of method that you can try, either roast in the oven or boil. I have shared oven roasted pork belly recipe about 3 years ago. I guess it took me three years to share another method. Blame my laziness, folks! I must have forgotten about it. 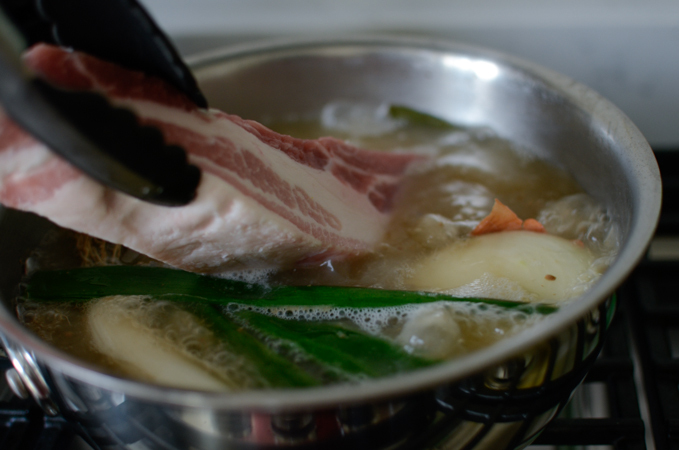 One key to make tender and juicy pork bossam is to boil the pork. You can also get rid of major fat out of the belly by using simmering method which results in tender piece of meat left. However, you have to be mindful of gamy smell and taste that can linger while simmering and it can bother some people. Koreans do not like gamy meat at all. So here is a recipe that can take care of that matter. 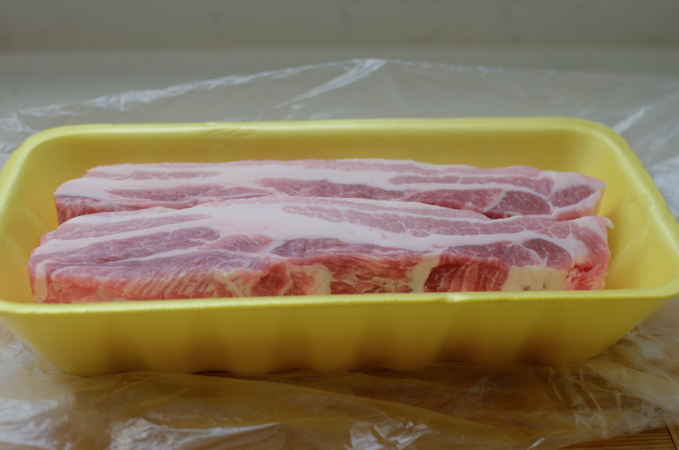 You will have moist, tender pork belly with clean aftertaste. How cool is that? You must get nice thick pork bellies. I like to use the one without the skin. If you like the chewiness of pork skin, you can get the one with. You can either get the entire slab of belly to feed a crowd or get a couple of small pieces. Make sure they are at least 1-1/2 inch thickness. Collect some rice starch water in a pot. Rice starch water is basically first or second rinsed water from the washing rice. If this doesn’t make any sense to you, which I think it is, click on my doenjang jjigae post to get an idea. It is very easy to collect the starch water from washing rice. And you will want some rice to eat with bossam anyway. The starch water is #1 ingredient that can help to eliminate the gamy smell. #2 will be a little bit of doenjang, the Korean soybean paste. The doenjang paste will also give a mild flavor to the meat that is screaming for Korean taste, which I love. #3 will be bay leaves. If you don’t have bay leaves, you can omit them. I also add Korean leaks as well. You can add regular leeks or onion. Bring the stock to boil first, then add the pork. Turn the heat to low and let it simmer for 45-50 minutes. 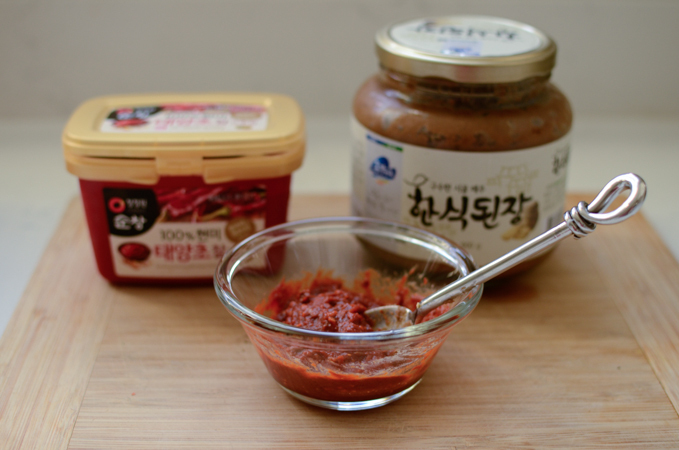 Meanwhile make topping sauce by combining Korean soybean paste(doenjang) and chili paste(gochujang), with a little bit of minced garlic. When the meat are ready, take them out. Slice into 1/4″ thickness or whatever thickness you desire. 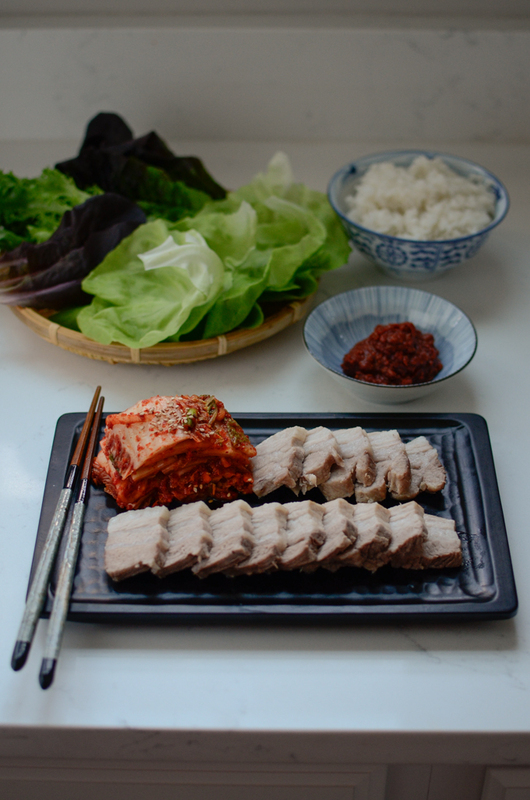 Arrange on a serving platter with fresh kimchi, topping sauce, and variety of lettuce leaves. 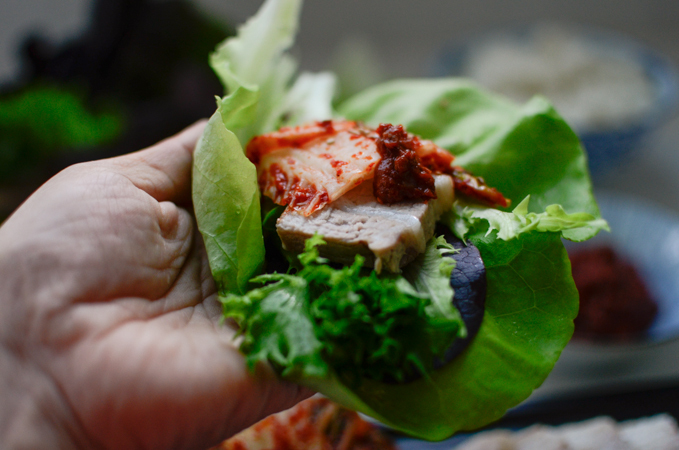 Make Korean lettuce wraps with pork belly, kimchi, and topping sauce. This is the very “Bossam”! Bossam literally means wrap thing around to eat. Does this bossam bring your Korean appetite back to you? I am not a big fan of pork but I can definitely eat this at least once a week. Pretty good! Hope you can try this and be able to enjoy the juicy Korean pork as much as I did. Cheers! Bossam is Korean style boiled pork belly. 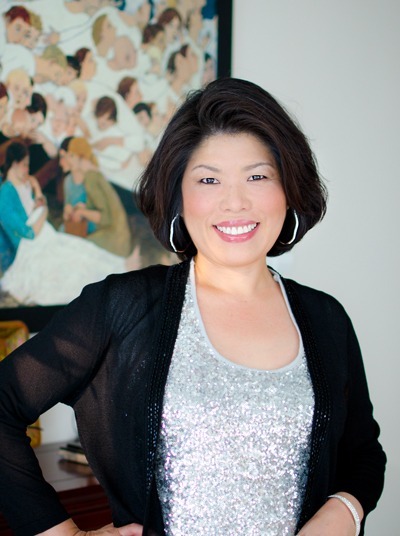 I will share a couple of tips to make the most juicy and succulent pork belly you can taste without the gamy smell. 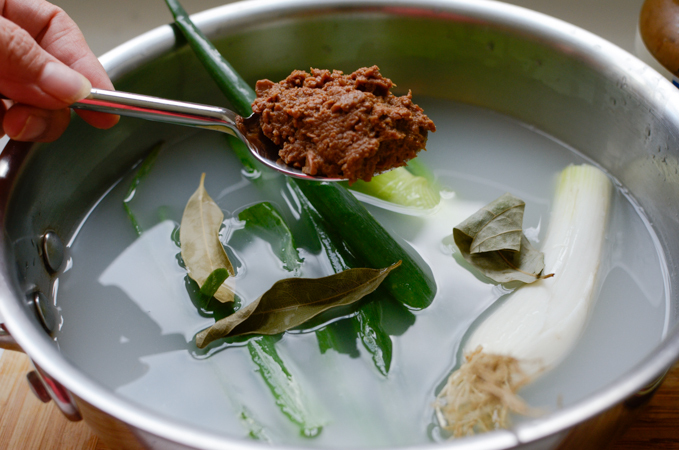 In a soup pot, combine rice starch water, leek, onion, soybean paste, bay leaves, and wine. Bring to boil. Add the pork belly and reduce the heat to low. Cover with a lid and simmer for 45-50 minutes. Meanwhile make the topping sauce by mixing the pastes and the garlic. 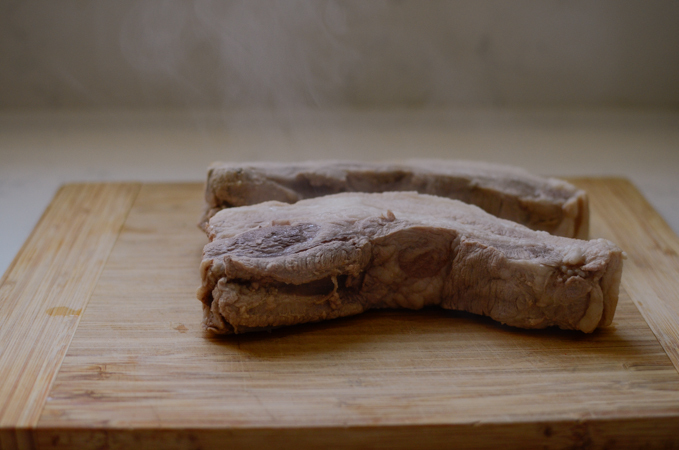 When the pork is done, slice into desired thickness, about 1/4-inch. Serve with assorted lettuce, kimchi, topping sauce, and rice. Pork belly is good stuff. Don't eat it that often (all that fat, you know) but love it whenever I do. Thanks! Wonderful match!!!! Pork belly is so good with kimchi. As my son needs a gluten-free diet the available doenjang around here is a no go for me. I managed to make my own gluten-free gochujang, but making doenjang is a longer process (though I'm willing to try it out soon). 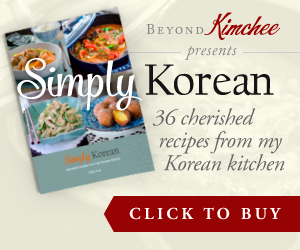 So, my question is, would it be possible to substitute doenjang with gluten-free miso to cook this recipe?